Not the most creative, but I like the little hearts! There's a blue, heart-shaped rhinestone on my ring finger, although it's hard to see against the polish. 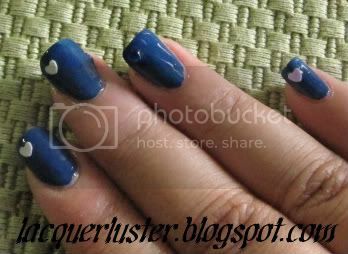 I used Love & Beauty Blue (found at Forever 21), and it was a one-coater! I really like the color; in the bottle it looks like a brighter royal blue, but it's darker on the nail. It's pretty much a plain, flat blue, no green or purple undertones, no shimmer or glitter, perfect for a Dodgers game! you should reverse the ring finger with white polish -- or is it too matchy? That's a really good idea, I think I might try something like that soon, since we're going to a game next Thursday.